Change of name ads in Mumbai Newspaper | Book Name change ad for passport in Mumbai Newspaper. Book Name Change Advertisement in Mumbai Newspapers in 3 Steps. Thanks for your Enquiry for Name Change Services Online for Mumbai Newspapers. Name change after adoption in Mumbai Newspapers. Surname change in Mumbai Newspaper. Spelling Mistake in Old Name in Mumbai Newspapers. Change of religion & Name in Mumbai Newspapers. Change of Birthdate in Mumbai Newspapers. Name change for Astrology in Mumbai Newspapers. 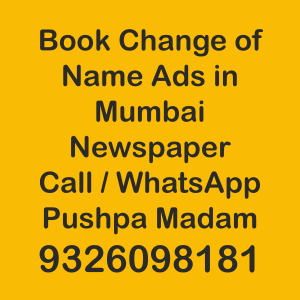 Q : How I can Order / Request for Change of name advertisement in Newspapers in Mumbai Newspapers. Q : What is the Format of the Affidavit for Name Change for Passport in Mumbai Newspapers. Ans : The Name Change Affidavit for Passport has its Own Format. get Sample in Mumbai Newspapers.